Location of Canton in Fulton County, Illinois. 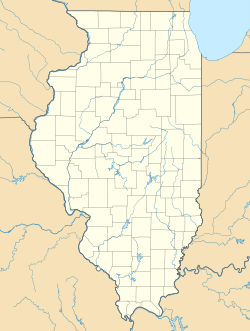 Canton is the largest city in Fulton County, Illinois, United States. The population was 14,704 at the 2010 census, down from 15,288 as of the 2000 census. The Canton Micropolitan Statistical Area covers all of Fulton County; it is in turn part of the wider Peoria-Canton, IL Combined Statistical Area (CSA). Canton is located in northeastern Fulton County at 40°33′28″N 90°02′03″W﻿ / ﻿40.557737°N 90.034264°W﻿ / 40.557737; -90.034264. Illinois Routes 9 and 78 pass through the downtown together. IL 9 leads east 8 miles (13 km) to Banner near the Illinois River and west 27 miles (43 km) to Bushnell, while IL 78 leads north 10 miles (16 km) to Farmington and south 11 miles (18 km) to Little America in the Illinois River valley. According to the 2010 census, Canton has a total area of 8.063 square miles (20.88 km2), of which 7.9 square miles (20.46 km2) (or 97.98%) is land and 0.163 square miles (0.42 km2) (or 2.02%) is water. Canton was founded in 1825 by settler Isaac Swan, who believed his new town and Canton, China, were antipodes. Abundant coal and labor, and the proximity of railroads and the Illinois River made Canton a factory town. The major manufacturing plant in town was P&O (Parlin & Orendorff) Plow Works, later International Harvester, which closed in 1983. In 1997, the 30-acre (120,000 m2) plant was destroyed by an arson fire, leaving the former industrial heart of the city a smoldering ruin, which has since been leveled. The town's employers now include the Illinois state prison named the Illinois River Correctional Center, the city's Graham Hospital, Cook Medical, Spoon River College and retail stores. Founder Isaac Swan, his infant child, and three other people died in a devastating tornado of June 1835. "Isaac Swan and his child were found in the wreckage of their cabin, the baby dying in its mother's arms," leading some to conclude that the tornado represented divine retribution for the city allowing a circus performance the previous week. The city was hit by another F-3 tornado on July 23, 1975. Two people were killed, and the storm caused major damage to the downtown area. A circus had visited the city just one week prior, the first circus to entertain in Canton since 1835. In November, 1975, the Canton City Council passed an ordinance banning circuses within the city limits in perpetuity. Much of the city, particularly the northern portion, has been undermined by room and pillar extraction of coal that took place in the 1800s. Sinkholes occasionally have occurred, leading to loss of property, but no documented injuries or deaths. Areas afflicted by mine subsidence have been cleverly redeveloped as parkland and recreational lakes. Central Illinois Energy, a locally financed cooperative, began planning for a corn-fermentation ethanol plant in 2002. Construction and finance delays resulted in its opening in 2007, approximately 4 miles (6 km) south of the city. Beset by financial problems and construction delays on the plant, the cooperative declared bankruptcy. Central Illinois Energy's assets were bought by a private company, construction was completed, and the plant began production in the summer of 2008, renamed Riverland Biofuels. The plant was shuttered again in 2010, and its facilities purchased by Aventine Renewable Energy. High grain prices have led to its continued idling, although production could be restarted on short notice. In December 2008, Cook Medical announced that it would open a new medical device factory at the old International Harvester site. Company owner William "Bill" Cook had grown up in Canton and wanted to do something to help revitalize his home town community. Some of the costs related to Cook Medical were planned to be paid for with state funds: a $750,000 Community Development Assistance Program grant from the Illinois Department of Commerce and Economic Opportunity and a $1.1 million grant from the Illinois Department of Transportation for infrastructure improvements near the plant. Scott Eells, the chief operating officer for Cook Group, has said that the factory will eventually be 45,000 square feet (4,200 m2), with more than 300 employees. Bill Cook had previously announced he was buying and renovating several old Canton buildings, including the 1883 Randolph Building on the town square.Cook purchased four buildings in downtown Canton, a shopping center, the site where the International Harvester plant was located as well as constructing the brand new Canton Harvester Inn boutique hotel and another factory—COOK Polymer. The Louis Pharmacy Building was purchased and restored. The Randolph Building is another Canton purchase made by Cook. The main floor offers store fronts and there are apartments for rent on the second level. Also purchased is the Fulton Square Shopping Center. November 16, 2016, A gas explosion killed an Ameren worker who was fixing a gas leak, sent 12 to the local hospital, and demolished an adjacent building on 1st Avenue that was attached to the Opera House. The next day the Opera House and two other buildings were declared beyond repair and condemned, an additional building declared uninhabitable until repaired, and 48 other buildings noted as damaged but repairable. Canton has a daily newspaper, The Daily Ledger, and three radio stations: WBYS and WCDD, and WILP, known as Q98.1. There is also a weekly newspaper, the Fulton Democrat, and a weekly shopping publication, The Independent Shopper. On September 13, 1967, Los Angeles rock band The Doors played a concert at Canton High School. The Canton audience reportedly reacted with mostly shocked silence at Jim Morrison's stage antics. As of the census of 2000, there were 15,288 people, 5,677 households, and 3,616 families residing in the city. The population density was 1,947.8 people per square mile (751.9/km²). There were 6,098 housing units at an average density of 776.9 per square mile (299.9/km²). The racial makeup of the city was 89.59% White, 8.85% African American, 0.14% Native American, 0.41% Asian, 0.02% Pacific Islander, 0.44% from other races, and 0.56% from two or more races. Hispanic or Latino of any race were 2.09% of the population. There were 5,677 households out of which 28.4% had children under the age of 18 living with them, 48.7% were married couples living together, 11.2% had a female householder with no husband present, and 36.3% were non-families. 32.1% of all households were made up of individuals and 17.1% had someone living alone who was 65 years of age or older. The average household size was 2.29 and the average family size was 2.86. In the city, the population was spread out with 20.3% under the age of 18, 10.3% from 18 to 24, 31.2% from 25 to 44, 20.0% from 45 to 64, and 18.4% who were 65 years of age or older. The median age was 38 years. For every 100 females, there were 115.8 males. For every 100 females age 18 and over, there were 119.4 males. The median income for a household in the city was $31,011, and the median income for a family was $39,910. Males had a median income of $30,519 versus $20,891 for females. The per capita income for the city was $17,012. About 10.1% of families and 13.4% of the population were below the poverty line, including 19.9% of those under age 18 and 5.4% of those age 65 or over. ^ a b c Canton Area Chamber of Commerce (January 1996). "The History of Canton, Illinois". Macomb, Illinois: Infobahn Outfitters, Inc. Retrieved 2008-12-14. ^ "Form of Government". City of Canton. 2011. Retrieved 15 June 2011. ^ "Geographic Identifiers: 2010 Census Summary File 1 (G001), Canton city, Illinois". American FactFinder. U.S. Census Bureau. Retrieved May 4, 2016. ^ Chapman, Chas. C. (17 Sep 2012). "History of Fulton County Illinois, Page 526". History of Fulton County Illinois. J.W. Franks & Sons, Peoria, Ill., 1879. Retrieved 17 Sep 2012. ^ "Fate of Riverland Biofuels plant still unclear". ^ "Cook Medical Brings New Beginning to Canton" (Press release). Bloomington, Indiana: Cook Medical. 2008-12-11. Retrieved 2009-10-19. ^ Froehling, John (2009-12-11). "Welcome Home, Bill Cook". Canton Daily Ledger. Canton, Illinois: GateHouse Media, Inc. Retrieved 2009-10-19. ^ "History | Canton Harvester Inn". www.cantonharvesterinn.com. Retrieved 2019-02-16. ^ a b Kravetz, Andy (November 17, 2016). "Three properties condemned, 48 others damaged in deadly Canton blast". PJStar.com. Peoria, Illinois: GateHouse Media. Retrieved November 17, 2016. ^ Vlahos, Nick; Eskridge, Larry (November 16, 2016). "Explosion rocks downtown Canton". Canton Daily Ledger (online ed.). Canton, Illinois: GateHouse Media. Retrieved November 17, 2016. ^ "The Doors | Canton High School Auditorium 1967". mildequator.com. Retrieved 2017-05-07. Wikimedia Commons has media related to Canton, Illinois. Wikisource has the text of the 1911 Encyclopædia Britannica article Canton (Illinois). This page was last edited on 16 April 2019, at 22:05 (UTC).